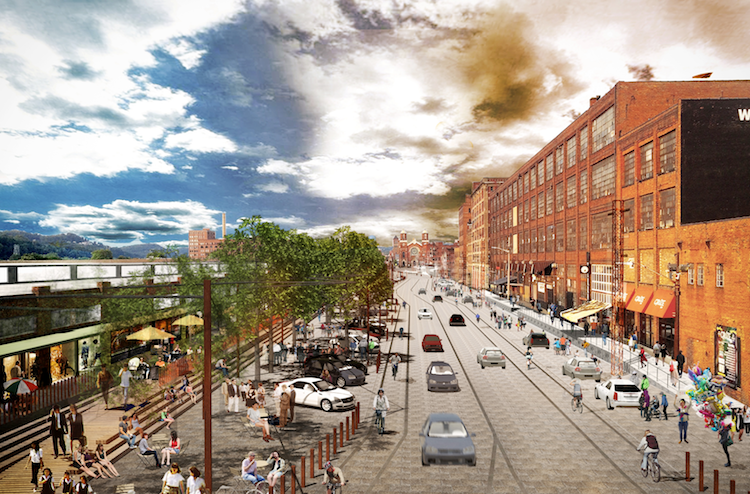 An architect's rendering of the redesigned Smallman Street between 16th and 21st streets, with an extended dock along the Produce Terminal, terrace, bike lane and vehicle lanes. 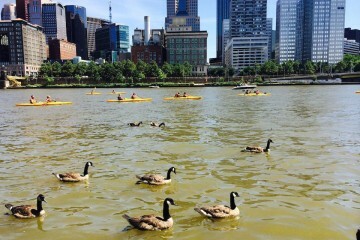 Photo courtesy of Pittsburgh Planning Department. Imagine a “super street” in the heart of the Strip District, with a sparkling aggregate surface lined in places with honey locust trees. Five-foot buffer zones would keep you from having to watch out for cars and trucks traveling two middle lanes. Sidewalks would widen into public terraces, with angled parking spaces and steps leading to an expanded dock along the Produce Terminal. City planners are using that design concept as a working blueprint for improving five blocks of Smallman Street. The design by Stoss Landscape Urbanism in Boston, Antunovich Associates of Arlington, Va., Sam Schwartz Engineering of Fairfax, Va., and Fennessy Consulting of Stoughton, Mass., takes into consideration public feedback from several meetings about the project that’s meant to complement a planned renovation of the mostly vacant produce auction house. 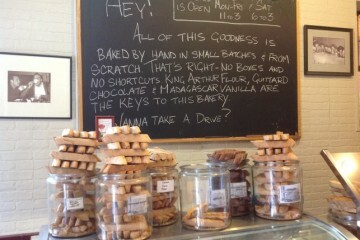 Smallman Street today. The Produce Terminal, which would be redeveloped by McCaffery Interests, is to the right. Photo courtesy of Pittsburgh Planning Department. Over several months, more than 130 people gathered at Contemporary Craft for brainstorming sessions about redesigning the section of the street. Their goal was to recognize the history of Smallman, support its local businesses and the church, yet create public spaces for daily use and special events. Remaking the five blocks of Smallman dominated by the terminal building—from the 16th Street Bridge to the historic St. Stanislaus Church at 21st Street—would cost from $10 million to $20 million, Gastil says, depending upon engineering results and the condition of pipes beneath the pavement. He’s optimistic that construction could begin in 2018. The state has committed $6 million in grants, and a $7.5 million tax-increment financing proposal is awaiting approval by city, county and school officials. 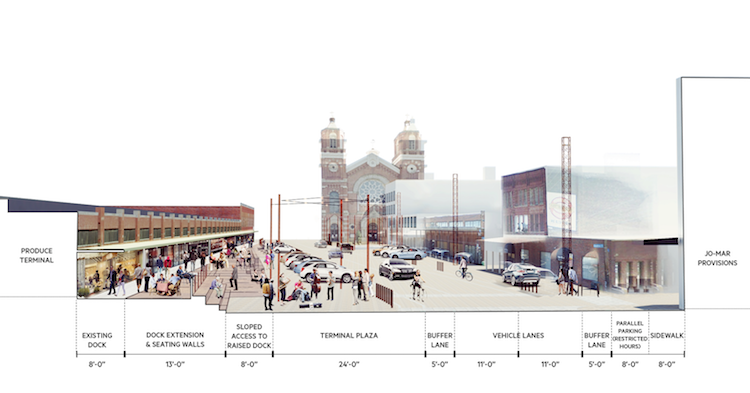 A cutaway view of the design concept for Smallman Street in the heart of the Strip District. Photo courtesy of Pittsburgh Planning Department. Dan McCaffery, CEO of Chicago-based McCaffery Interests, has said the public improvements are an integral part of his plan to convert the terminal building and the 1600 Smallman warehouse across the street into offices and retail space. McCaffery plans to start construction late this year. “What we’ve heard throughout are concerns over safety, usability and design, and I think the plan does a very good job of improving Smallman on all fronts. So, I’m very optimistic about what this can mean for the neighborhood,” says Mike Lee, board president for Strip District Neighbors. 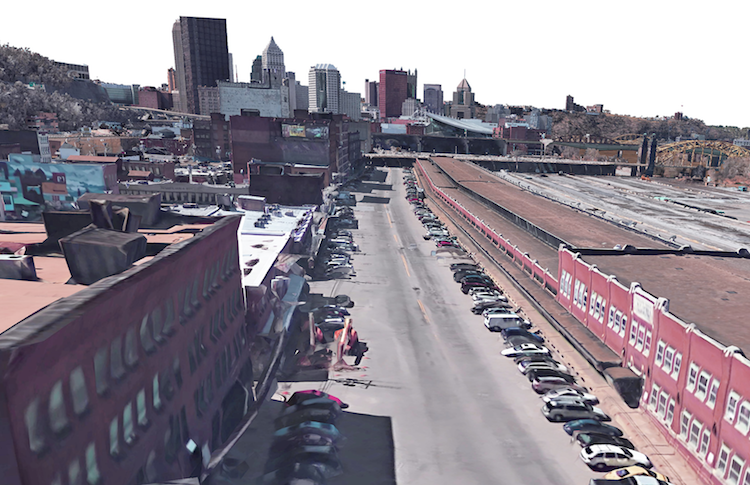 To make Smallman safer for pedestrians, crosswalks would correspond with three passageways to be cut through the terminal as connections to the Allegheny River. A crosswalk at 21st Street would be illuminated. In the Stoss design, most parking would move behind the terminal building. The number of spaces would increase from the existing 237 (some of which are permit or private parking) to 602, including spaces along both sides of Smallman. The plan accommodates delivery trucks typically unloading between 17th and 19th streets. Public plazas with unique lighting are a feature of the Smallman Street redesign developed by Stoss Landscape Urbanism in Boston. Photo courtesy of Pittsburgh Planning Department. The street would meander, to slow traffic, and could be closed for special events. A bike lane behind the terminal would separate cyclists from cars and trucks. Steps from the dock could double as seating with integral lighting, and ramps would ensure ADA compliance. A plaza near the church would be one of three public gathering spaces. The architects envisioned an art wall at 16th Street and tall rail yard poles for lighting as a way of calling attention to the area’s history as a rail yard. They suggest using heritage materials such as Belgian block, concrete, timbers, brick and bollards. Heritage materials are an inspired idea, says Gastil, but the original Belgian block beneath the asphalt might not be usable and actual rail ties won’t be repurposed to build the extended dock and steps. Those could be made of wood, however, “a wonderful, warm material” to use with exposed aggregate in pedestrian areas. “As much as we’re looking at heritage materials, we have to consider the safety of pedestrians and all those other factors” such as accommodating people with disabilities, says Gastil. 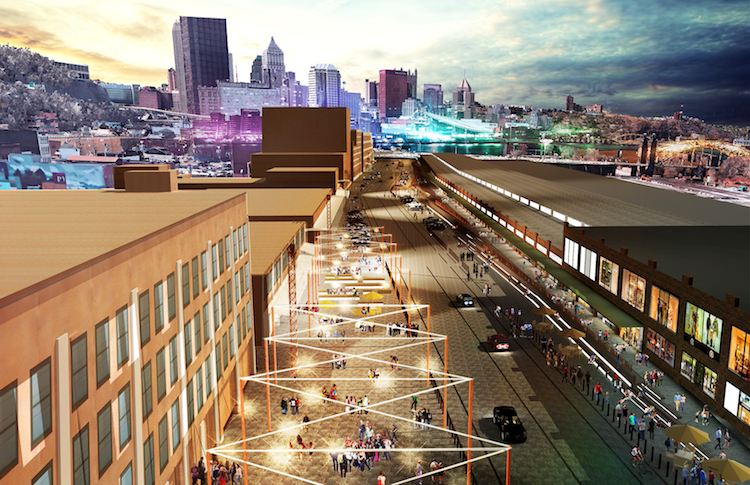 But the steel rail yard light poles would be “something a little different” and would illuminate a broad area. The plan also has catenary lighting over the terraces. The next step in the project is “hunkering down, doing work with our consultants and with city departments” to advance the design to schematic phase, Gastil says. Another community meeting is likely in a few months. His department wants to update Strip District stakeholders more regularly, with a goal of breaking ground late next year. “That’s an optimistic position, but I think it is possible,” Gastil says.